= No Yearly membership fee for silver plan member. = Vroom App can be downloaded from Google and IStore. Through the App members can access all the services. They can manage their vehicle information, tax/ registration/ insurance data along with reminders. = One silver plan member can manage maximum 2 number of vehicles through the above App or through Website access. = In the App/Website reminders can be set for vehicle fitness date, tax token, insurance etc. = Members can purchase their vehicle insurance from Vroom partner Greed Delta Insurance and get the insurance documents at their home/office delivered. To buy, please email to info@vroom.com.bd. Vroom team will contact the customer for next activity. = Silver Members can get emergency road side assistance service within Dhaka city (From 8 am to 8 pm). Vroom will send mechanic for technical assistance to resolve the problem on spot, if not they will arrange for towing service and workshop liaison. Per mechanic call cost is BDT 500. = If the member wants to call a mechanic to his/her home office to check the vehicle for any potential trouble - our team visit and provide any kind of technical support at home. Charge of BDT 500 per call mechanic visit. = Member can use any workshop for his/her vehicle related works. But in any case any vehicle owner have confusion regarding workshop estimation/bills; we can assist by verifying the estimation via email. = We provide free tire rotation service round the year. Tire rotation means check the condition of tire and help accordingly. Normally it cost BDT 500, but we provide free check-up. = At the end of the year – when the membership renewal is due, Vroom will provide BDT 500 as cash back against the payment of services by the member has taken all the year round. It will be adjusted against any future services taken. = One Gold plan member can manage maximum 5 number of vehicles through the above App or through Website access. = Gold Members can get emergency road side assistance service within Dhaka city (From 8 am to 8 pm). Vroom will send mechanic for technical assistance to resolve the problem on spot, if not they will arrange for towing service and workshop liaison. Per mechanic call cost is BDT 500. = At the end of the year – when the membership renewal is due, Vroom will provide BDT 1,000 as cash back against the payment of services by the member has taken all the year round. It will be adjusted against any future services taken. = Vroom will provide free insurance coverage up to BDT 100,000 for accidental insurance (Only for driver). To avail this service, the member needs to complete the necessary forms with driver details. Kindly notify your intent to take the complimentary Accidental coverage. The coverage will given by Green Delta Insurance Company Ltd.
= One Platinum plan member can manage maximum 5 number of vehicles through the above App or through Website access. = Platinum Members will get Free Third-Party vehicle insurance Vroom partner Greed Delta Insurance and get the insurance documents at their home/office delivered. To buy, please email to info@vroom.com.bd. Vroom team will contact the customer for next activity. = We provide road side assistance service within Dhaka city. If a vehicle run down in the middle of the road, than any platinum card holder can call us for technical assistance to resolve the problem on spot. Free service. = Platinum Members can get emergency road side assistance service anywhere in Bangladesh. Vroom will send mechanic for technical assistance to resolve the problem on spot, if not they will arrange for towing service and workshop liaison. No Mechanic cost. Vroom will provide towing service, if required. Within Dhaka city Towing charge BDT 5,000 and BDT 15000 is for outside Dhaka city. = If the member wants to call a mechanic to his/her home office to check the vehicle for any potential trouble - our team visit and provide any kind of technical support at home. Charge is Free. 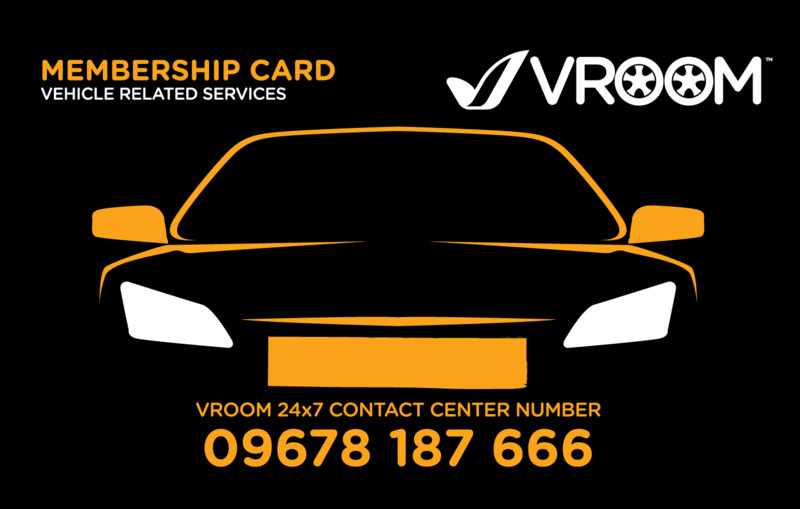 = At the end of the year – when the membership renewal is due, Vroom will provide 50% of the Service Bill (excluding materials) as cash back against the payment of services by the member has taken all the year round. It will be adjusted against any future services taken. = Vroom will provide free insurance coverage up to BDT 500,000 for accidental insurance (driver & 4 passengers – BDT 100,000 each max). To avail this service, the member needs to complete the necessary forms with driver & passenger details. Kindly notify your intent to take the complimentary Accidental coverage. The coverage will given by Green Delta Insurance Company Ltd.